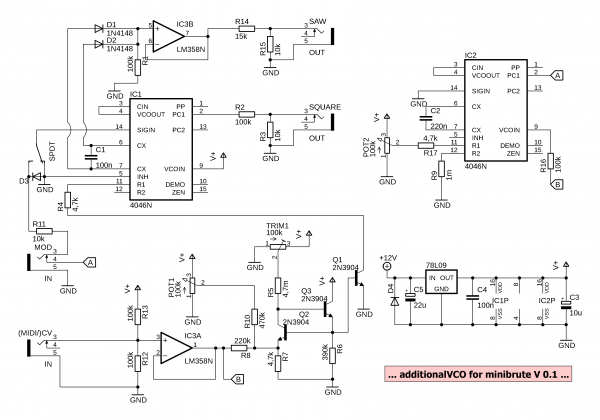 So I was trying to build a tuneable VCO based on the CD 4046 ic, that I can feed into the the external input from my Minibrute and also use as stand alone with filters and stuff. To build a linear tracking VCO with this IC is pretty easy, but to get exponential tracking was pretty challenging for me. The outcome is now a VCO that is somehow tuneable to 1V/oct, but it only stays in tune at the higher octaves and miss the notes a bit at the lower octaves. the lowest note I got out of this VCO was a C2. To get some more unusual sounds I added another CD 4046 build as a modulation VCO. The modulation VCO follows the first VCO in a linear manner. The modulation VCO and the main VCO are both fed into the 4046 XOR Gate. You get nice detuned ringmodulation sounds out of it. It is okay to skip the voltage regulator and use it with 12V (but I always use regulated 9V with cmos ics somehow). If you use a power splitter cable the circuit can share the power supply with the minibrute. Change the resistors at the saw and square output, if you need a louder output signal. Diode D3 should be a Schottky. HAS SOME ISSUES, better not use it. ... I am still working on this. The schematic above has several issues, do not use it. In the current state it is possible to play almost 6 octaves or more in tune, starting from C1. 4-5 octaves should be totally achievable, at least. I will upload the updated schematics within the next weeks.